COPENHAGEN, Denmark – Yet another argument in favour of using bikes for shopping, taking kids to school, and commuting. In the Netherlands and also in Denmark: where bikes are used for transportation as well as recreation, the financial crisis is having little effect on bicycle sales. Despite the financial crisis the Danish bike market sold a half million units in 2008. In 2006 that mark was first passed and since that year the Danish bike market has shown a slow but steady growth. Except for 2008. However, with a drop in sales of only 1.9% (approximately 10,000 units) it might be more accurate to say last year’s bike sales in Denmark merely levelled off. As in other years, the data for this 2008 and 2009 report on the Danish bike business comes from Erik Oddershede, director of the Danish association for bike dealers ‘Danske Cykelhandlere’. According to Oddershede, when the financial crisis hit Denmark in the fall of 2008, the bike business experienced a small decline in sales for 3 to 4 months. “Luckily it hit us at a time of the year when sales normally are already declining,” said Oddershede. 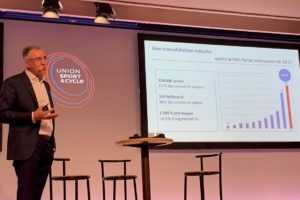 “That is why the total numbers of bikes sold went down only slightly, 10,767 (units) to be precise.” The term ‘sold’ refers to domestic deliveries to dealers and other distribution channels. 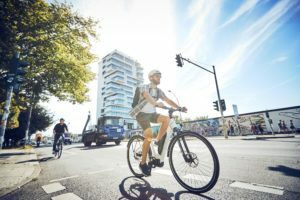 According to estimates by Danske Cykelhandlere 543,533 bicycles were delivered to dealers in Denmark in 2008, as noted, a 1.9% drop from the 2007 total. However, the Danish Statistical Bureau calculates a bigger decline in sales – 5.1% lower in 2008, compared to 2007. The ‘official’ bike sales figure from the Danish Statistical Bureau is much higher than the one from Danske Cykelhandlere and Erik Oddershede. That figure stands at 677,040 for 2008, 36,000 units below the 2007 total. As indicated in the box article underneath, Erik Oddershede claims the import and domestic consumption figures from the Danish Statistical Bureau are incorrect. Demographics on Denmark related to bike sale prove him correct. That data says that the population in Denmark stands at about 5.5 million. Based on the number of bikes sold during that past few years that would mean that one out of every eight Danes buys a new bicycle every year. Even in bike crazy Holland that ratio stands at only one in 12.9 Dutch buying a new bike every year. So, the conclusion is that the Danish Statistical Bureau presents overly optimistic sales figures. Because of that, Oddershede calculated corrected, estimated figures for the Danske Cykelhandlere association. This year the Danish bike market is making up for the small drop in 2008. However, only in terms of turnover. 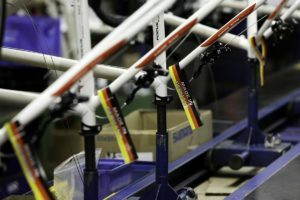 Oddeshede states, “Since January 2009 the turnover in the bicycle business has increased and we are expecting a 5% increase for the whole of 2009. 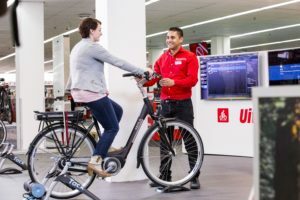 In units we expect to end the year with a small decline of 2 to 3%.”That the Danish market is growing money-wise this year cannot be contributed to higher sales of expensive electric bicycles. 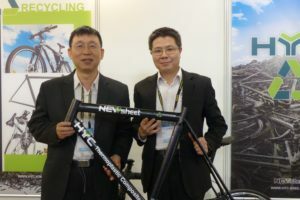 It is expected that by the end of 2009 the number of e-bikes sold won’t surpass 2008. Last year that number stood at about 8,000 units. As in Holland, Danish bike dealers account for the majority of sales. But while Dutch dealers make up over 85% of all sales, the dealer market share in Denmark is much lower. And unfortunately, dropped a bit last year. Dealers in Denmark accounted for 63% of all bike sales in 2008, as opposed to 65% in 2007. The average price for a bike sold by dealers upped a bit in 2008 and stood at DEK 3,800 (€ 507). Danish bike production dropped over 20% last year, to 83,103 units. Bike exports from Denmark also dropped in 2008 – about 30%. The country has only one big bike maker left. It is Kildemoes Cykelfabrik A/S – a subsidiary of Cycleurope AB, where about 83,000 bicycles came off the assembly line. Most of the bikes produced and sold in Denmark are City Bikes with internal gear hubs. According to the estimates by Danske Cykelhandlere, these bikes represented 35% of all bikes sold in 2008. They became slightly less popular compared to 2007 when their market share stood at 38%. Number two in the ranking of most popular bikes, stands the Classic Dutch Bike in Denmark. This type is commonly characterized as the ‘Granny Bike’. Strangely enough in Holland it’s the most preferred bike model of students. This could be the same in Denmark, as the market share of this model stands at 25%. MTBs and road racers each have about a 10% share in sales. Strangely, Trekking bikes are not so popular in this Scandinavian country, where they only account for 8% of total sales, much lower than neighbouring markets in Germany and the Netherlands. As for the outlook on 2010 bike sales, expectations are high. This is due to a bike buying incentive scheme from the Danish government. To spur sales the government has granted a subsidy of DEK 1 billion (€ 1.3 million) for a 5 year period. Bike sales will undoubtedly benefit.